It's just not summer without a new Stephanie Plum novel! I'm always excited when my copy comes in at the library. One of the great things about working at the library is showing up at work to find books waiting on my desk, and when one of those books is the latest Stephanie Plum, I know it's going to be a good day. The only sad thing is how quickly I read through it! This one did not disappoint. Stephanie, bounty hunter not-so-extraordinaire, is trying to locate used-car dealer Jimmy Poletti, who is able to stay one step ahead of her while bodies, apparently connected to his crimes, are discovered one by one. There are many familiar elements here: cars exploding, apartments burning down, romantic tension between Stephanie and Ranger (and, of course, Morelli), Grandma Mazur excited about going to funeral homes, and pot roast dinners at Stephanie's house. I find these elements enjoyable, part of revisiting Trenton with some of my favorite fictional characters, and I continue to enjoy the way Evanovich is able to make me laugh while drawing me into another fun screwball mystery. I'm a bit baffled by some of negative reviews I've seen out there by fans of the early books who find recent ones to be repetitive and predictable. Why, exactly, would they pick up a book in this series expecting something different? I wouldn't watch a James Bond movie and then complain that oh, there's Q again, going on and on about the gadgets, and oh, there's Moneypenny lusting after James, and James is with another woman, and oh, jeez, a villain stroking a white cat again? It seems unfair to criticize a series for being exactly what it sets out to be. 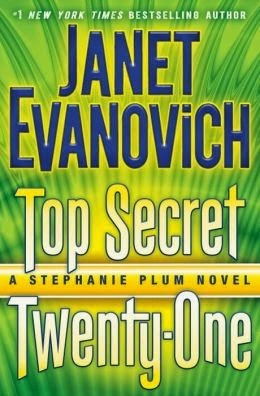 Evanovich delivers a fun, gripping, delightful summer read for me, and of course I enjoy some books in the series more than others, but I know what I'm getting when I open to the first page. It works for me. If it didn't, I'd simply drop the series and move on to something else.